As an old boy of the school, I had the first hand experience of the difficulties encountered by an ordinary Wahyanite in his daily learning. Nearly 100% of the F1 newbies of Wah Yan is from Chinese speaking primary schools. In the switching from an CMI school to an EMI school, the first obstacle that a student needs to overcome is the language barrier. And the first obstacle in learning any foreign language is vocabulary. As a Wahyanite who had struggled through the process and got admitted to university, I still could not forget all the difficulty in those old days. I could say most of my lesson time wasted in my junior form was due to this language barrier. Wah Yan College Hong Kong is one of the very few Band 1 schools having a Chinese speaking feeder school in Hong Kong. Most Band 1 schools have either an English speaking feeder school or no feeder school at all. For schools with an English speaking feeder school, EMI is not a great problem. For schools with no feeder school, their F1 newbies are from the top 20-30% of individual chinese speaking primary schools. As a matter of fact, we are admitting about 70% of the students of our Chinese speaking feeder school, our situation is much more critical than those encountered by other Band 1 schools. According to my mom, my elder sister who had always got first in her class in a Chinese speaking primary school had a very difficult time when she got admitted to an EMI secondary school. It took her almost 6 months to reach a proficiency level barely enough for her to understand what was going on in the classroom. Students in Wah Yan are no exception. Almost once every two years, one Wah Yan student who had once got top in the class in his primary study got deferred in the class. The new government EMI policy exasperated the situation further. The policy allows teachers to use only English as the medium of instruction in non-Chinese subjects. In those old days, many lessons in Wah Yan were actually taught almost completely in Cantonese. 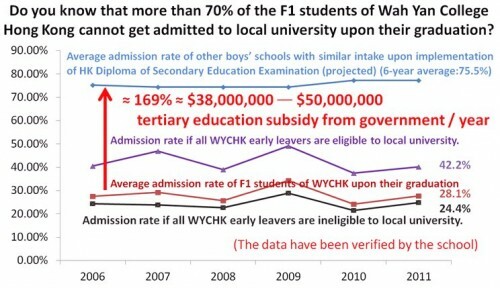 Though the language factor alone is not good enough to fully account for the difference between 28.1% and 75.5% in university admission rate, if the problem can be tackled effectively, the situation could be much improved without a total re-engineering of Wah Yan.